It's amazing how powerfully our moods can impact our vitality. And how our gloomy or negative moods can quickly blend into one another to become our attitude. And how this attitude soon affects our physical feelings – and in particular our vitality or ‘energy levels’. It's because mind and body affect one another - and what we habitually think about and dwell upon determines whether we feel tired and lethargic or feel alert and vital. Yes, tiredness is often the result of hard work. And this kind of tiredness usually passes after a rest or a good night’s sleep. But there is another form of tiredness which doesn’t go away after resting. It’s there when we go to sleep and is still there when we awake eight hours later. It’s a bone-deep weariness that doesn’t seem to abate. And often this is the result how we habitually think - of our attitude. So is ‘positive thinking’ the answer? Maybe. Or maybe not. It’s not easy to remain cheerful and optimistic just by thinking a few positive thoughts. So is exercise the answer? If not positive thinking or exercise what to do? Stimulate yourself! Change your routine. Get out of the rut. Introduce change and variety into your day – in very, very small ways. Just 10% every day or two, in fact. We need routine to make our lives run smoothly and to do things efficiently. But never-ending and never-changing routine can be decidedly 'un-useful'! Balance this by offering yourself the 10% New challenge for a couple of weeks: do something new or slightly different every day for 14 days. .. the list could be endless - add your own. 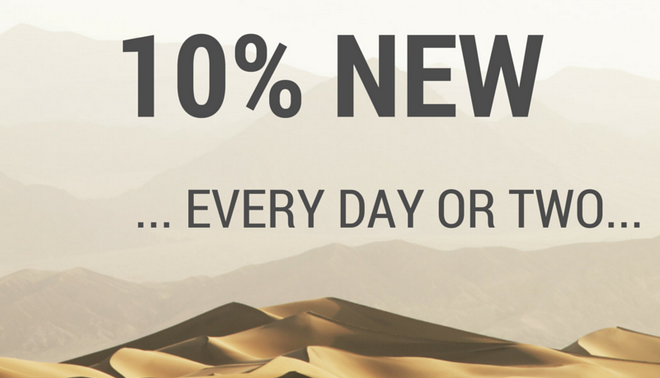 Finally, keep it to 10% New – not 90% - trying to change too much and too quickly can quickly be off-putting.